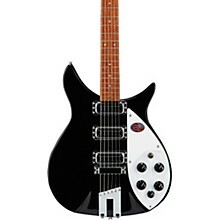 Classic Ric design with kickin' Ric performance. 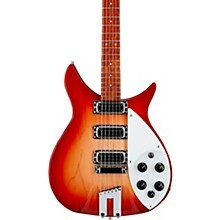 The Rickenbacker 350V63 Electric Guitar is based on the classic 325 Series guitars. This vintage stylization updates the traditional design to full-scale size and performance. Vintage reissue pickups, solid black knobs, replica tuners, and trapeze tailpiece hark back to another era, but offer the feel and sound modern guitarists demand. Top, sides, and support ribbing are carved from a single piece of maple. Cross-grain laminated maple neck with rosewood fingerboard. Pickups are single-coil for warm biting tone, with individual pole pieces. Includes case. 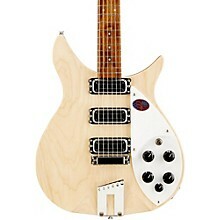 True Rickenbacker tone can't be imitated. 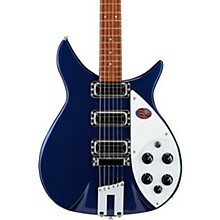 Take the plunge and make this guitar yours today.